Summary: This is a continuation of a cooperative study begun in 2009 with David Addison of The Conservancy of SW FL?s Science Dept. and Dr. Katherine Mansfield, Assistant Research Professor and CIMAS Fellow at Florida International University. The subjects for this 5-year study are loggerhead turtles with documented long-term histories of inter-annual remigration to nest on Keewaydin Is. The intent is to satellite tag a suite of these remigrants to determine if they use similar migratory routes over successive reproductive seasons. This research will also identify their foraging areas and determine if they return to these same locations after each nesting season. Further, the data will augment existing information on post-nesting movements from other Gulf of Mexico (GOM) nesting beaches. It will also broaden our knowledge regarding areas in the GOM that are foci of inter-annual foraging as well as enhance our ability to more fully assess risks from commercial Gulf fisheries. This dataset has added relevance due to possible residual impacts from the Deep Water Horizon oil spill. 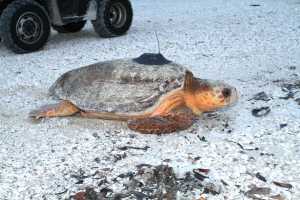 Four loggerheads were tagged in 2009, seven in 2010 and 11 in 2011. In 2011, one of the satellite tagged turtles from 2009 was retagged. Some portion of the previously tagged turtles will return in 2012. Six to eight satellite tags will be needed make sure we can tag all the turtles that potentially could return. A major goal of the first three years of this research was to increase the sample size; now 22. With this accomplished, the successful completion of this study hinges on having sufficient tags available in 2012 and on into 2013. Results: As of the Final Report, the tags on all three of the loggerheads that were satellite tagged for a second season were still transmitting. Only the tag on the turtle named Aunt Nancy has ceased transmitting. All of the turtles have dispersed and have remained in the foraging areas they settled into within the first 6 months of the project. Like Emily, the first turtle we satellite tagged for a second time in 2011, all of the retagged turtles (Kelly, Jill and RTWO- DTWO) returned to the same foraging areas to which they migrated when they were first tagged in 2010.